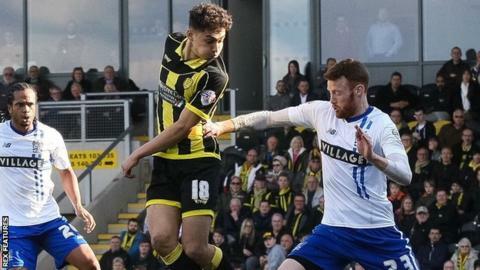 Ten-man Burton scored a late equaliser in an action-packed game against Bury. The visitors did well to compete with high-flying Burton, before Hamza Choudhury received a second yellow card for a late tackle. Bury quickly capitalised and led through substitute Ryan Lowe's header from Dan Gardner's cross. Burton pushed numbers forward and were rewarded when substitute Tyler Walker scored his first goal for the club with a back-heel to equalise in injury time. It was only the second goal as a professional for on-loan Walker, the son of former England defender Des. Burton dropped to second place, a point behind Wigan, who were 5-1 winners away at Shrewsbury, while Bury are 10 points clear of the relegation zone. "It feels like a win. I know it's not but we feel as though we should have won over the course of the game. "Up to the sending off we pressed, we tried and we created chances. It's just one wouldn't drop for us. It seemed as though we were going to get nothing from the game until the last few minutes. "It's an incredible point in the circumstances and we think it could be a very important one." Match ends, Burton Albion 1, Bury 1. Second Half ends, Burton Albion 1, Bury 1. Attempt missed. Lucas Akins (Burton Albion) header from the centre of the box is too high. Goal! Burton Albion 1, Bury 1. Tyler Walker (Burton Albion) right footed shot from very close range to the centre of the goal. Assisted by Lucas Akins. Corner, Bury. Conceded by John Mousinho. Ryan Lowe (Bury) is shown the yellow card for a bad foul. Attempt blocked. Dan Gardner (Bury) right footed shot from outside the box is blocked. Corner, Burton Albion. Conceded by Chris Neal. Attempt saved. Tyler Walker (Burton Albion) right footed shot from the left side of the box is saved in the bottom left corner. Attempt missed. Lucas Akins (Burton Albion) left footed shot from outside the box is too high. Foul by John O'Sullivan (Bury). Tyler Walker (Burton Albion) wins a free kick in the defensive half. Attempt saved. Ryan Lowe (Bury) right footed shot from the centre of the box is saved in the bottom right corner. Substitution, Burton Albion. Tyler Walker replaces Philip Edwards. Goal! Burton Albion 0, Bury 1. Ryan Lowe (Bury) header from the centre of the box to the bottom left corner. Assisted by Dan Gardner. Chris Hussey (Bury) wins a free kick in the defensive half. John Mousinho (Burton Albion) is shown the yellow card. Foul by Peter Clarke (Bury). Stuart Beavon (Burton Albion) wins a free kick in the attacking half. Substitution, Bury. Ryan Lowe replaces Tom Pope. Second yellow card to Hamza Choudhury (Burton Albion) for a bad foul. Attempt missed. Tom Pope (Bury) right footed shot from outside the box is close, but misses to the right. Attempt blocked. Marcus Myers-Harness (Burton Albion) right footed shot from outside the box is blocked. Substitution, Burton Albion. Marcus Myers-Harness replaces Mason Bennett. Attempt missed. Nathan Delfouneso (Bury) left footed shot from outside the box is close, but misses to the right. Attempt blocked. Danny Mayor (Bury) right footed shot from more than 35 yards is blocked. Attempt blocked. Mason Bennett (Burton Albion) right footed shot from the centre of the box is blocked. Hamza Choudhury (Burton Albion) is shown the yellow card for a bad foul. John O'Sullivan (Bury) wins a free kick in the defensive half. Foul by Hamza Choudhury (Burton Albion). Attempt blocked. Lucas Akins (Burton Albion) right footed shot from the centre of the box is blocked. Attempt missed. Danny Pugh (Bury) left footed shot from outside the box is high and wide to the left. Attempt saved. Mark Duffy (Burton Albion) right footed shot from the centre of the box is saved in the centre of the goal. Attempt saved. Lucas Akins (Burton Albion) left footed shot from the centre of the box is saved in the bottom right corner. Corner, Burton Albion. Conceded by Craig Jones.